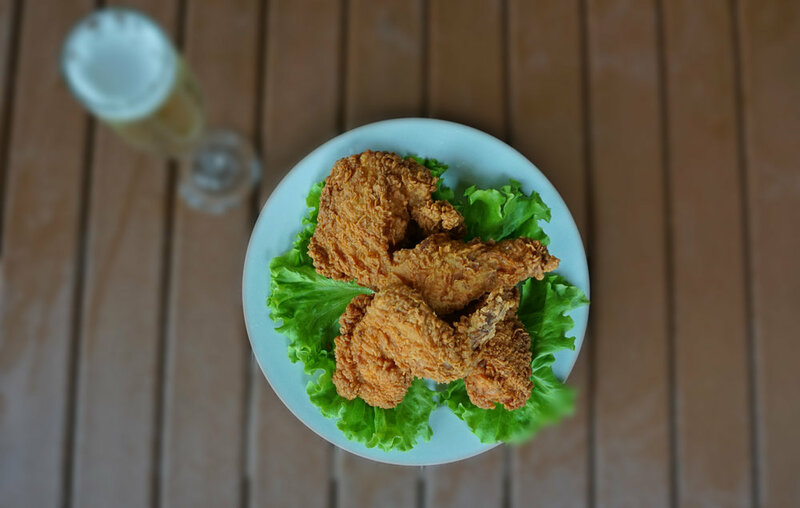 Champagne & fried chicken, y'all. As strange as it might sound, we have recently discovered something that might pair better with fried chicken than a cold brew: bubbly. Yep, real fancy-schmancy French champagne. You have to believe us. Imagine taking your first bite of our famous southern fried chicken...You immediately crunch into the crispy from-scratch recipe, feeling the salt & pepper against your lips. Then, there's the perfectly cooked hot and juicy chicken. The flavor is everything you've been craving for what seems to have been your whole life! Now, take a sip of champagne. No, not a big swig of beer. We mean it. Sip some champagne. The effervescence is not unlike beer, and yet it's a whole new experience! The bubbles burst in your mouth, mixing with the pepper left behind by the chicken, and tap dance on your tongue like a little man wearing flavor shoes! Join us for brunch on Saturdays & Sundays from 11am til 3pm, and we'll strike ya a deal! Order some good ole southern fried chicken & waffles, and we'll buy you a glass of Trouillard Champagne! Party of two? If y'all each order the chicken, have a bottle of Celene Brut Cremant de Bordeaux (an awesome French sparkling) on the house! "I'll have a mimosa, hold the OJ." Whether you're watching the game, out with the fam, or just looking for a reason to day-drink, we're tellin you...you gotta try that champagne & fried chicken! Why? Because brunch. Because delicious.